January 2015 | Bloomfield Cooling, Heating & Electric, Inc.
We know you are prepared for the worst in the event of a blackout because you purchased or have had your generator serviced from Bloomfield Cooling, Heating & Electric, Inc. So – right off the bat here – let me say “Thank-you” again for choosing us. We’ll do our best to continue serving you beyond your expectations. But we still need to tell you that as a generator owner you must partner with us to make sure your generator is always ready for a storm. After all, your generator is an expensive piece of equipment and you are at its mercy in the event of a blackout. Therefore we would like you to review these reminders. Listen for the generator to perform its weekly test. The generator will start and exercise once a week, on the day and time specified. During this exercise period, the unit runs for approximately 12 minutes and then shuts down. Your generator will not run any electric in the house during the exercise cycle unless utility power is lost. Yellow – Maintenance; your generator is in need of a maintenance. Red – Fault; indicates that either the unit is switched to OFF or that there is a Fault detected. Contact us at 973-237-0505 in the event of red light. If your schedule changes and you are not available to hear the weekly test, you must check the indicator lights. If this schedule change is permanent it may be time to change the exercise time on your generator. Move the AUTO/OFF/MANUAL switch to the OFF position. Let generator stand for a minimum of 1 hour. This is to let the oil settle and cool to give you a more accurate measurement. TIP: The longer you can leave the unit off for this step the better. Locate the dipstick – It is yellow or orange in color and has a T-handle. Remove dipstick and wipe it off with a clean cloth. Insert the dipstick back into the generator. Make sure it is completely inserted. Leave the dipstick in for 5 seconds. Remove the dipstick for the second time. You should now be able to see how much oil remains in the generator. If the oil level reads more than half on the dipstick do not add oil. If the oil level is below half, oil needs to be added. To add oil, remove cap (round) to fill oil. On 7 kW and 8 kW Generators the dipstick and fill are the same. Pour oil into chamber. TIP: Funnels are very useful for this. Wait 5 minutes for the oil to settle and repeat steps to determine if you need to add additional oil. When finished, turn from OFF position back to AUTO. Homeowners do not need to check oil after or during normal exercises. Winter brings colder temperatures and lots of snow. Your standby generator has to operate when you need it most. 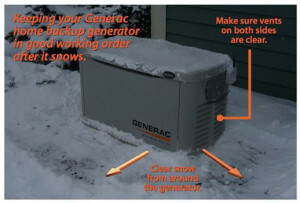 Therefore you MUST clear the area around your home standby generator. When you are clearing snow after a storm, make sure you also clear a path to the generator and clean the snow away from the cabinet. While snow blowing, ensure that you do not blow the drifts against the generator. Is Your HVAC System the Correct Size for Your Home?